It’s the perennial high school dilemma: to be a popular athlete or a studious nerd. Some lucky people have it all but for the rest, it’s mostly one or the other. And it seems it was ever thus. 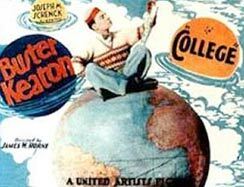 Even back in the ’20s, as Buster Keaton’s film College reveals, bookworms were reviled by their sporty colleagues. But what really shatters the egos of these poor souls is when their heart-throbs turn on them too. Ronald (Keaton) has made his mother eternally proud by becoming Dux of California’s Union High but when invited to give a speech on Graduation Day, he chooses a most unfortunate topic; ‘The Curse of Athletics’. By the end of his dissertation, every single student has marched out of the hall in disgust, even sweet Mary Haynes (Annie Cornwall). “When you change your mind about athletics, I’ll change my mind about you.” she curtly tells him via the traditional silent movie device of the inter-title. And so the gauntlet is thrown down. Casting his academic pursuits to the wind, Ronald embarks on a rigorous training regime as soon as he arrives at Clayton College where Mary and her sporty, if somewhat stupid suitor Jeff (Harold Goodwin) are also in residence. In a series of ridiculous sequences Ronald demonstrates his ineptitude for any kind of ‘fizzical’ exercise. Only when motivated to save Mary from his by now menacing rival does he leap into superhuman action to save the day and win his lady’s heart. It’s a simple enough story with the Great Stone Face, ironically, in top physical shape. Appearing mostly in a singlet and shorts, you can clearly see those taut, muscular limbs that enabled him to do all his own stunt work (all except a climactic pole vault, which was brilliantly executed by his Olympic gold medal-winning body double Lee Barnes). At 32, Keaton was probably a little too old to play a college student but the film was one of a wave of similarly themed movies and he surfed it like a true pro.